It was a beautiful day for a rodeo…blue skies and puffy clouds. 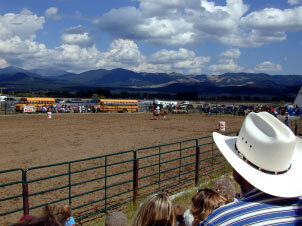 We took off for the little town of Boulder and their yearly rodeo. Couldn’t miss the fair grounds…you have to look quick to see Boulder’s main street. The parking lot required never lifting your eyes from the ground, lest you take a ‘horse pie slide. After safely negotiating the danger area…we picked a seat and got ready for the fun. I get such a kick out of people watching. Most of the people attending were cheering on a friend or family member. And the local boys got a heap of encouragement! There was an extra degree of excitement here that was missing in the “big rodeo”we went to…It was up close and personal to these folks. There were a number of children out ‘practicing’ in the arena before the show. They looked like peanuts up on those big horses. Sticking like little burrs…Born to the life. There were plenty of chills and spills. I asked one lady if she was enjoying herself. She said “NO”! I said, “Why did you come then?” she said, “Because my grandson is a bronc rider…Scares me the death…but I come and cheer him on. He’s ranked 15th in the nationals…just out of High School. And he won a rodeo scholarship.” (I didn’t know they HAD such a thing) Bless her for gritting her teeth and giving him support. He’ll probably never know what it costs her. This was in a small uncovered arena. The broncs and bulls would come right up and slam into the fence in front of us. Hard way to make a living!